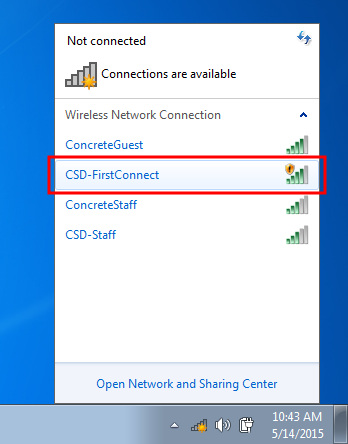 Connect to the “CSD-FirstConnect” Wi-Fi network. This network only allows access to the Wi-Fi login page. Try to browse to a webpage and you will be redirected to the Wi-Fi login page. Sign in with your regular school computer username and password. A program called “prov.exe” will be downloaded. 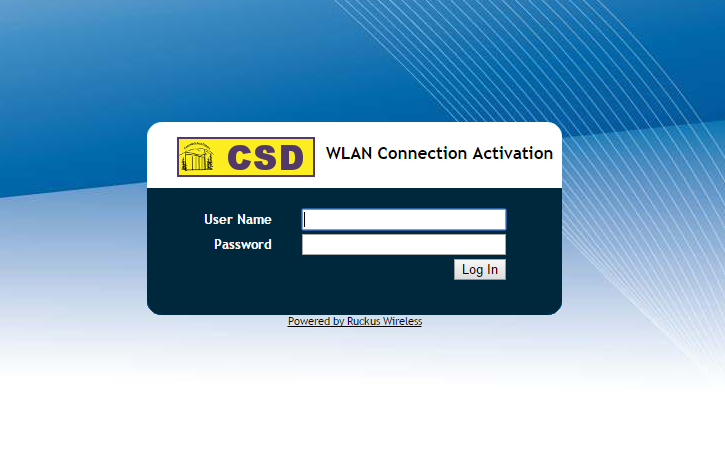 Run this program and it will automatically connect you to the “CSD-Staff” with your personalized Wi-Fi password. This is a one-time process. After this setup, your laptop should remember the network and password and connect automatically. 1. Click the Wi-Fi button in the bottom right of your screen (near the time). 3. You will see this message. Click “Connect”. Make sure to keep “Connect automatically” unchecked. 4. Open up a web browser (Chrome is suggested) and try to browse to a web page. You will be redirected to the sign-in page pictured below. If you are not redirected, type in wifi.concrete.k12.wa.us/activate in the address bar. Login using your regular school computer username and password. 5. A program called “prov.exe” will be downloaded. Your browser may warn you about the program but it’s safe. Click “Keep”. 6. Open “prov.exe” by clicking it in the bottom left of your browser window if you are using Chrome (pictured below). Alternatively, you can go to where you downloaded the file, normally your Downloads folder, and double click it to run. 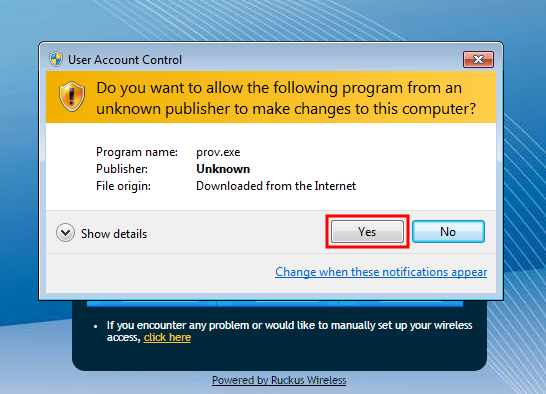 This program will automatically install your personalized Wi-Fi password and connect you to the full Wi-Fi network. 7. Depending on your computer’s settings, you may see a security warning. 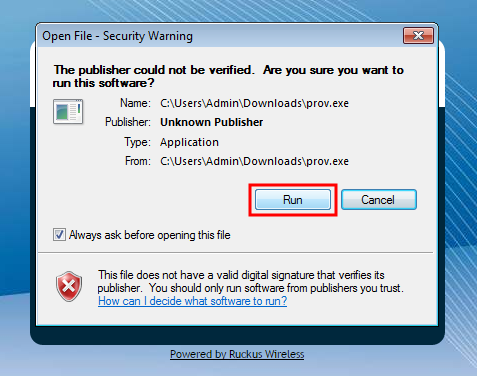 Click “Run”. 8. You may see an additional warning. Click “Yes”. 9. The program will now run and finish quickly. You should see a success message. Click “Close”. 10. That’s it! 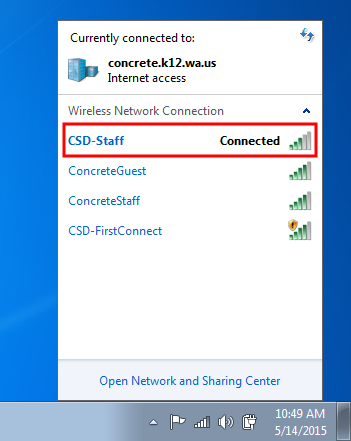 You should now be connected to “CSD-Staff” and have full Wi-Fi access. Verify that you are connected to the right network by clicking the Wi-Fi button in the lower right of your screen (near the time). It should say “Connected” next to “CSD-Staff”. If it does not, just click it to connect. This setup is a one time process. Your laptop should remember the correct network and password and connect automatically from now on. Please remember that activating a device on the Wi-Fi with your login info will tie that device to you. Do not sign in on another person’s device. You may be held responsible for activities that originate from it.